"The two armies met in battle on the morning of July 21, 1861, along the banks of a small stream known as Bull Run. In a ten-hour contest, the green, inexperienced troops of both sides bravely fought and held their ground. By late afternoon, however, the federal troops, driven from the battlefield along with many of the sightseers, were in retreat. Hope of a quick and easy victory was a casualty of the day, along with almost 5,000 members from both armies and bystanders. Daylight faded from the once peaceful fields, bringing to an end not only the first major confrontation of the Civil War, but also the romantic way in which the majority of Americans had viewed the coming conflict." This is the line of Union Guns which dueled against the Rebels, with Henry House in sight as well. The Union lines were counterattacked from those thar woods..
"The field officers of the more than 2,000 routed men of the commands of Evans and Bee, among whom Federal shot and shell from the batteries of Griffin and Ricketts were raining, were making desperate efforts to rally their men and reorganize them, but to no purpose, although Johnston and Beauregard both joined in the effort. Strong masses of Federal infantry were rapidly advancing, and disaster seemed imminent, when the heroic Bee, exhausted in his fruitless effort to rally his men, rode up to Jackson, who was steadily holding his brigade in a full fronting position, notwithstanding the approaching attack of the enemy, the artillery fire that was thinning his ranks, and the nearby confusion, and cried out in a tone of despair: "General, they are beating us back!" The reply came, prompt and curt, but calm, "Then we will give them the bayonet." "
"The blazing and defiant look of Jackson, his bold and prompt determination, and the steady line of brave men that supported him, gave new life to Bee. Galloping back to the disorganized masses of his command, he shouted, waving his hand to the left: "Look! There is Jackson, standing like a stone wall. Rally behind the Virginians! Let us determine to die here, and we will conquer. Follow me!" Obedient to this clarion call to duty and the example of soldierly bearing to which their attention had been called, a number of Bee's men rallied and followed him in a charge to the left against the advancing enemy, in which this heroic leader fell dead. 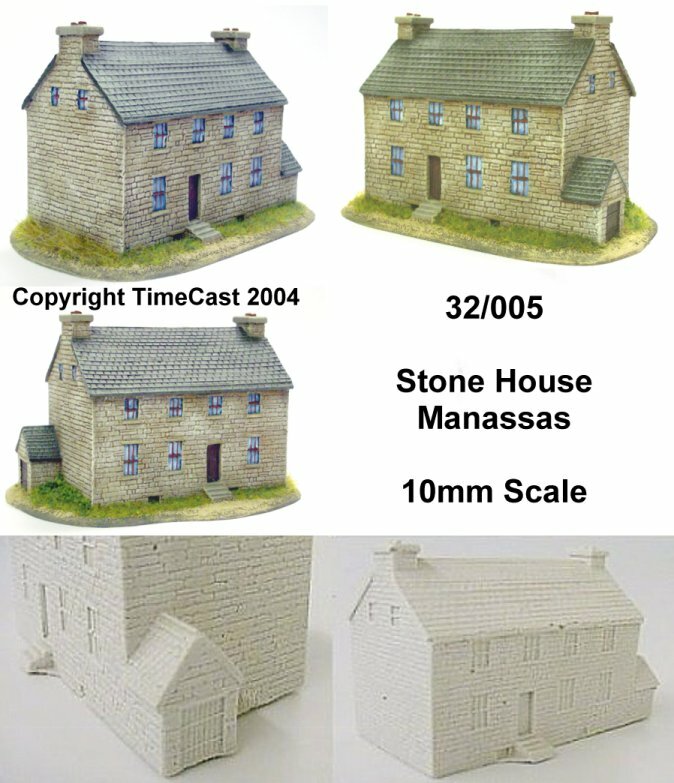 From that time forward, through all the ages of history, Jackson became, and will continue to be, "Stonewall" Jackson, and his brigade the "Stonewall brigade." "McDowell, watching from the Sudley ridge slope the wavering battle, followed up his attack by continuing to extend his right with fresh bodies of infantry and artillery as they came forward from the rear, and by so doing threatening to turn Beauregard's left. Some of the Federal guns were pressed so boldly to the front that men from the Thirty-third Virginia sprang forward and captured them, but they were soon retaken. 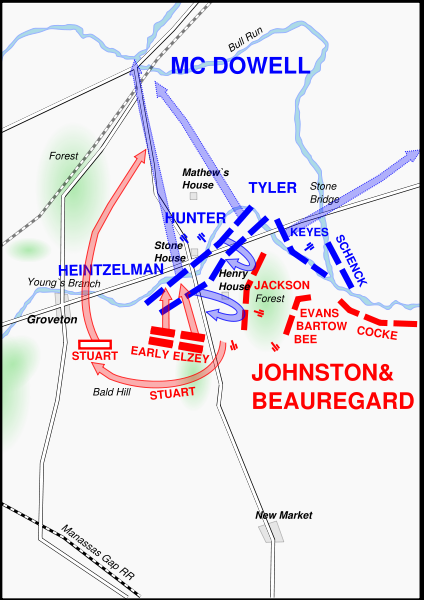 To meet this threatened blow on his left, Beauregard took the offensive and ordered a counterstroke from his right to clean off the Henry plateau in his front. The commands of Bee, Bartow, Evans and Hampton, the men who had so bravely and stubbornly held back McDowell's advance in the early morning, now responded with spirit and speed, striking the Federal left; Jackson, with strong and steady blows, pierced its center, while Smith's Virginians and Gartrell's Georgians charged on its right. This bold movement, sweeping over both infantry and artillery, entirely cleared the plateau of Federal troops and captured the batteries of Ricketts and Griffin." This is the rebels eye view - the gun position is almost invisible . With the prospect of being cannistered from close range, they would have covered this ground pretty quickly. Interested in the ACW, but daunted by the choice of books available ? Want some recommendations? Visit my American Civil War bookshop, with a limited pick of recommended books on the war. Visit the US version or UK version to start (or continue) your education.